Founded in 1848 by William Holman Hunt, John Everett Millais and Dante Gabriel Rossetti, the Pre-Raphaelites were a hugely influential group of painters who were interested in moving away from the overblown and inauthentic gestures they saw in the paintings of Raphael and Michelangelo. 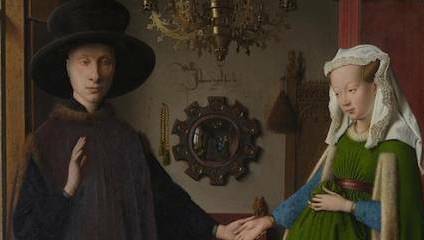 As part of their interest in older art, the exhibition charts the influence of one painting in particular, the Van Eyck painting known as the Arnolfini portrait. Jan van Eyck’s famous work, painted in 1434, is much more naturalistic than the work of Raphael, and the Mannerists that followed, often situated in a domestic space with more subdued poses and gestures. This image depicts a couple standing in a room, holding hands as if in a marriage ceremony. The wife is pregnant and cradles her stomach, whilst the man stands looking directly out of the frame. The perspective of the portrait is strange and the proportions of the room slightly uneven; between the two individuals is a convex mirror, in which we can see the room reflected back, and details of two others in the room. This convex mirror, surrounded by religious iconography in smaller circles around the frame, is both reflective and distorting, suggesting the space that lies outside of the frame and its effects on what is contained within the frame. When this portrait first went on display, it was a huge hit with a Victorian audience, many of whom were amazed to see an early example of Netherlandish painting. The National Gallery’s current exhibition contends that this image, first displayed in the gallery in 1842, has been supremely influential not only on the public in general but the Pre-Raphaelites brotherhood in particular. In this intimate showing, the curators have explored different aspects of the painting, fing echoes across a range of paintings in not only subject matter, but also composition and painting technique. The effects of the portrait’s play with time and space are felt throughout the exhibition. In John Everett Millais’s Mariana from 1851, the medieval and the modern are contrasted through Mariana’s dress and the setting, suggesting a continuum from the past to the present. The painting also replicates the skilled oil painting of Van Eyck, layered to produce a gleaming jewel-like effect. In Mark Gertler’s Still Life with Self-Portrait, a later work from 1918, Gertler has created a hybrid painting, in which the mirror both shows the painter, and functions as part of a more traditional composition as part of a still life. This painting genre, often associated with death, also shows the painter in his home, suggesting the interrelationship between the domestic, art and death. In another room, the explanatory notes elucidate how the mirror became a way of either furthering narrative within painting, or as a way of revealing consciousness. In Ford Madox Brown’s unfinished portrait, Take your Son, Sir!, a mirror sits behind a woman who holds out a new born baby. In the mirror, we see the painter looking at his new-born son, suggesting the difference between familial roles, and perhaps the distance between mother and father, made literal through the composition. In William Holman Hunt’s The Awakening Conscience, the mirror reveals the internal desire of the female protagonist, who is caught between her lover and a lost innocence, represented by the garden seen in a mirror. In both paintings, the mirror allows the viewer another perspective into the frame, suggesting the continuation of the world depicted within it. The exhibition also suggests the historical relationship between the narrative of The Lady of Shalott and the portrait. A favourite topic for pre-Raphealite painters, in these images the influences are perhaps more oblique, but with a contextual showing, an extremely fruitful dialogue emerges. The narrative of this myth and poem, in which a woman is condemned to look upon life through a mirror whilst she is trapped in a tower, is combined with some details inherited through van Eyck’s portrait, such as the pose of the woman, and the layout of this domestic space. In William Holman Hunt’s striking The Lady of Shalott, painted between 1886-1905, the rich colours and objects scattered around the room, including a pair of detailed wooden clogs invite a direct comparison between the two. This exhibition does not patronise the viewer and makes several complex points about influence in art, exploring the myriad forms that it can take. The various depictions of interiors, and the use of a mirror as a way of transforming the space within and without the frame are particularly interesting. Contemporary viewers are given the opportunity to marvel at the durability of the Arnolfini, in both its artistic influence and, indeed, its unusual beauty. However, this is more than just a way of inviting direct comparison between paintings, and instead invites contemplation of the idea of influence and creative dialogue. Reflections: Van Eyck and the Pre-Raphaelites is on at the National Gallery until 2 April 2018. Tickets from £8.